CarGurus has 51,429 nationwide Fusion listings starting at $780. Now in the last year of its current generation, the 2012 Ford Fusion continues to impress owners and reviewers alike, thanks to its attractive exterior design, roomy interior, available high-tech features and wide range of trims and engine choices, including 4- and 6-cylinder powerplants, as well the fuel-efficient Fusion Hybrid. Some testers find the 2012 Fusion trims equipped with the 4-cylinder powerplant underpowered, as well as noisy when pushed, and some recent new owners have reported issues with build quality, including engine and transmission problems. If you've had your eye on the Ford Fusion for awhile, this might be the best time to get your hands on one, since dealers will probably be clearing out their stock in anticipation of the next-generation 2013 Fusion, due later in 2012. Although it's been a couple of years since its last updating, the current Fusion continues to garner awards and acclaim, with many calling it the perfect family sedan. And with a wide range of trims and powerplants available, you'll more than likely find one that fits your needs and budget. Make sure you have a good warranty, though, as some new owners have reported engine and transmission problems with the vehicle soon after leaving the showroom floor. With an all-new, next-generation Fusion waiting in the wings for the 2013 model year, the current '12 version of Ford's affordable midsize family sedan carries over from the previous year with few changes. Still, that's not a bad thing. Since its mid-generation refresh in 2010, the Fusion has consistently ranked at or near the top of its class and received positive comments from owners and reviewers alike. And despite being deep into its current generation, the Fusion continues to deliver a potent blend of comfort, economy, style, build quality and practicality. For 2012, the Fusion displays the exterior and interior enhancements it received during its 2010 refresh. Outside, its sculpted lines, domed hood, angled headlights and aggressive front-end styling, dominated by Ford's distinctive three-barred chrome grille, give the Fusion a clean, sporty look, while inside the Fusion offers plenty of space and a quiet, comfortable ride. Metallic finishes on the dash, doors, center console, and steering wheel, as well as soft-touch surfaces and high-quality materials, provide an upscale feel. Top it off with the latest tech gear like Ford's MyKey and SYNC systems, and it's easy to see why the Fusion continues to sell at a good clip. Ford offers the Fusion with four engine choices for 2012, spread over a variety of trims. Basic trim levels include the S, SE, SEL, and Sport, with the three lower-end trims available with 4-cylinder powerplants, and the SE and SEL trims also available with a 3.0-liter Duratec V6. Meanwhile, the Sport pumps out the power with an aggressive 3.5-liter Duratec V6. In addition, Ford offers the Fusion as a Hybrid, equipped with a 2.5-liter Atkinson-Cycle gas engine and electric motor. 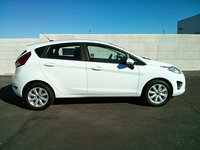 Feature updates are minor for 2012 and focus primarily on the SE (the most popular Fusion trim), which now comes standard with a 6-speed automatic transmission and 17-inch aluminum wheels. The Fusion continues to garner awards. For 2012, it was named a Consumers Digest Best Buy and a Top Safety Pick by the IIHS. In addition, it was named both the Best Affordable Midsize Car for the Money and the Best Affordable Midsize Car for Families by U.S. News and World Report. As its base powerplant, the front-wheel-drive Fusion retains its 2.5-liter Duratec 4-cylinder engine, which drives the S, SE and SEL trims. The engine produces a decent 175 hp and 172 lb-ft of torque, adequate for most around-town driving situations. At the base S level, the engine links to a standard 6-speed manual transmission, with a 6-speed automatic transmission available as an option. At the SE and SEL levels, the 6-speed automatic becomes standard, while owners can upgrade to an available 6-speed SelectShift Automatic transmission with a thumb shifter for changing gears manually. Fuel economy estimates range from 22/30 mpg for trims equipped with the SelectShift transmission to 23/33 mpg for those with the regular automatic. The S trim with the manual shifter falls in between at 22/32 mpg. 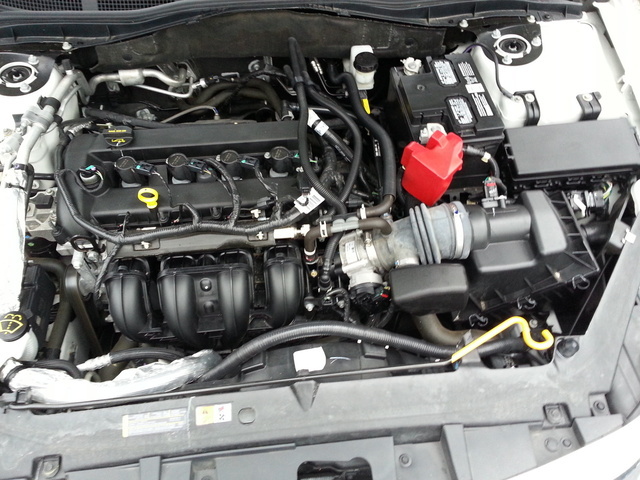 For those seeking more power, Ford offers a 3.0-liter Duratec V6 as an optional engine for the SE and SEL trims. It generates 240 hp and 223 lb-ft of torque, and links to the SelectShift transmission. Fuel economy numbers check in at 20/28 for the V6/SelectShift combination. In addition, Ford continues to offer the Fusion with an optional all-wheel-drive system on trims equipped with the V6 engine. For AWD-equipped trims, fuel economy drops to 18/26. The Sport trim pumps up the ponies to 263, putting it at the top of the performance heap, thanks to its 3.5-liter Duratec V6, again matched with the SelectShift 6-speed automatic transmission and available with AWD. The engine produces 249 lb-ft of torque while posting fuel economy numbers of 18/27 with FWD and 17/24 with AWD. The Fusion Hybrid, which many consider one of the most impressive hybrids in the segment, comes equipped with a 2.5-liter Atkinson-cycle gas engine. It's paired with a NiMH-powered electric motor, charged through regenerative braking. Combined horsepower checks in at a decent 191 horses, but the Hybrid really shines in its fuel economy, posting numbers of 41/36 mpg. The Hybrid's powertrain also includes an electronic continuously variable transmission (CVT), which behaves much like an automatic. The Hybrid also includes a SmartGauge instrument cluster with an EcoGuide, which adds two LCD displays on either side of the speedometer, providing information about the hybrid system and fuel economy and encouraging smart driving practices. The Fusion's driving dynamics remain quick and nimble, with a firm rather than plush ride. The V6 powerplants continue to provide smooth acceleration with plenty of power for passing and merging. However, some reviewers find trims equipped with the 4-cylinder underpowered at times. Most trims ride on a European-inspired suspension consisting of a front double-wishbone and rear multi-link setup, with disc brakes all around. The Fusion Sport upgrades to a sport-tuned suspension for an even firmer ride. Electric power-assisted steering comes standard on the S, SE, SEL and Hybrid trims, while the Sport gets a more traditional hydraulic power-assisted steering rack that greatly improves road feel. Although it understeers at times, the Fusion generally holds the road well, with plenty of grip and well-controlled body roll. It also handles bumpy roads well, and noise, vibration and harshness are acceptable under typical driving conditions, although the Fusion's engines can become noisy when pushed. Most owners find the seats comfortable for longer trips, with good support and bolstering in the front. The rear seats offer slightly less padding and, as is typical in the segment, two adults, rather than three, would be more comfortable riding in the back. The S rides on 16-inch wheels with all-season tires, while the SE and SEL upgrade to 17-inch alloy wheels. The Hybrid gets unique 15-spoke, 17-inch wheels, and the Fusion Sport sits on 18-inch aluminum wheels. The 5-passenger Fusion has received numerous kudos for its comfortable and spacious cabin. Even taller passengers will find plenty of legroom in both the front and back seats, although headroom in the front can sometimes be tight for those over 6 feet tall. The interior materials are generally attractive and soft to the touch, with even the plastic surfaces providing pleasant tactile feedback. Some reviewers find the center stack a little too busy, with numerous knobs and controls, but overall the dash and instrument gauges display a clean, symmetrical design. Manual climate control comes standard on the S, SE and Sport trims, while the SEL and Hybrid are upgraded to dual-zone automatic climate control, which comes standard. All trims include a tilt/telescopic steering wheel, and all but the entry-level S incorporate cruise and audio controls. 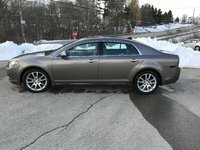 The S, SE and SEL are equipped with cloth bucket seats, while the SEL goes more upscale with leather upholstery and a leather-trimmed steering wheel. The Hybrid receives eco-friendly cloth seating made from 45 percent post-industrial materials, while the Sport gets unique leather-upholstered seats with side bolsters and colored inserts and stitching. The Fusion continues to come equipped with a number of high-tech standard and optional features. Ford's SYNC system, which integrates voice-activated phone and entertainment systems, comes standard in the SEL, Sport and Hybrid trims, and it's optional for the SE. In addition, HD radio and a navigation system with Sirius XM traffic and travel information are available in the SEL, Sport and Hybrid. Audio systems range from a standard 4-speaker unit in the S to an optional 390-watt Sony Premium sound system, available in the SEL, Sport and Hybrid. All trims but the S come with a 6-month trial subscription to Sirius XM satellite radio. Other tech features include a rear-view camera, available in SEL, Sport and Hybrid trims, and a Reverse Sensing System, which provides an audible alert if it detects an object behind the car when backing up. It comes standard for the Hybrid, and it's optional for the SEL and Sport trims. 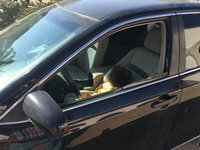 In addition, all trims come equipped with the automaker's MyKey system, which enables parents to moderate younger drivers' habits by setting limits on speed and audio volume, among other capabilities. All gasoline-powered trims come equipped with a folding 60/40 split rear seat to increase the car's 16.5 cubic feet of trunk space. Due to its battery, located under the rear seat and trunk, the Hybrid has a fixed rear seat, and trunk space is reduced to 11.8 cubic feet. The Fusion generally performs well in crash tests. The IIHS rated the vehicle a Top Safety Pick, as it received a top score of Good for front, side, and rear crash testing, as well as for roof strength. The NHSTA gave the Focus 4 out of 5 stars in side crash and rollover tests, and 3 out of 5 for frontal crashes. When equipped with AWD, the Fusion scored 5 out of 5 stars in rollover tests. All Fusions come standard with Ford's AdvanceTrac traction control system with electronic stability control, which applies the brakes and adjusts engine power when it detects wheel slippage. 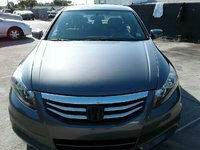 In addition, all trims include dual front airbags, front-seat side airbags and side-curtain airbags as standard equipment. The Hybrid adds a seventh airbag at the driver’s knee. 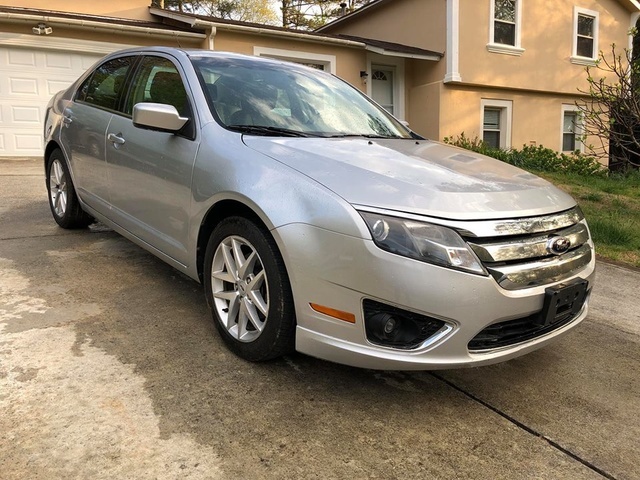 The Fusion's smooth ride, comfortable interior and overall value continue to garner positive comments from owners, who also like the fuel economy of the 4-cylinder trims and the Hybrid. The Hybrid in particular wows owners with its impressive mileage. While some owners wish the base engine offered more power, those who stepped up to one of the V6 engines like the brisk acceleration those powerplants provide. Handling also gets good marks from owners, who like the Fusion's tight, firm feel. However, reviews are mixed for the Fusion's build quality, with some owners reporting problems such as hard shifting from the automatic transmission and minor (and in some cases major) engine problems. In addition, thick C-pillars can limit rearward visibility, some owners note. However, most owners generally find the Fusion a good-looking, comfortable and stylish people mover and a competent alternative to competitive import vehicles. What's your take on the 2012 Ford Fusion? Guru9FTR7 what causes AWD light to come on ? Gary We are the Proud Owners of the Ford Fusion 2012!! And! We are always looking forward to out-of town trips in Comfort, Style and of course ... Luxery!! Kudos to the Ford Motor Company for Excellence! Design! And last; but, not least ... Economy!! Users ranked 2012 Ford Fusion against other cars which they drove/owned. Each ranking was based on 9 categories. Here is the summary of top rankings. Have you driven a 2012 Ford Fusion? The car got a problem with the battery last Christmas and when it got fixed the radio doesn’t work anymore. Any situation like mine? And how did you fix this one? After we had a dead batter in our 2012 Ford Fusion there is no sound from radio or phone when connected. How to fix?